Being obese can be a very isolating experience, and losing weight can be difficult for anyone, particularly for a teenager. A new study, funded by the National Institutes of Health, finds that teenage girls gained less weight, ate less fast foods, improved their body images and had more family interaction over meals, after participating in a six-month program designed especially for teenage girls. The program involved weekly peer meetings, consultations with primary care providers and separate meetings for their parents. Conducted by Kaiser Permanente, the study is the first to report long-term results from a weight management program designed specifically for this age group. In previous programs, younger children, teens and family members were included. This one was designed for teen girls only. "Nearly one-third of teenage girls [between the ages of 12 and 17] are overweight or obese, and many of them are likely to become obese adults," said Dr. Lynn DeBar, lead author and senior investigator with the Kaiser Permanente Center for Health Research. "Our study shows that intervention programs can help these girls achieve long-term success managing their weight and also learning new habits that will hopefully carry over into their adult life." The study focused on 208 girls, ages 12 to 17, who lived in the states of Oregon and Washington during 2005-2009. All of the girls were classified as being obese. Half of the girls were assigned to the program and the other half got usual care. Girls assigned to the usual-care group received information on changing their lifestyles along with a visit from a physician at the start of the study. The girls in the program, however, met weekly with other teenage girls as well as with a behavioral counselor during the first three months, and then every other week after that for the remaining three months. The teens were asked to keep food and activity diaries, along with charting their weight. At each meeting, they discussed their journals and their progress. The program was designed to focus on cutting down portion sizes, watching what types of foods they were eating including the reduction of fast food and sweetened beverages in their diets. Doctors in the program also suggested the girls have more meals with their families, instead of on the go or with friends. The girls were also encouraged to exercise at least 5 days a week for 30 to 60 minutes and were introduced to yoga classes. Their parents were asked to attend separate weekly meetings to learn how to support their daughters. Although the program was intensive, researchers say they found it made all the difference. "Many teenage girls are still growing taller, so for them, maintaining weight or slowing weight gain is an acceptable goal," said Dr. Phil Wu, a pediatrician who leads Kaiser Permanente's effort to prevent and treat childhood obesity and is also a co-author of the study. 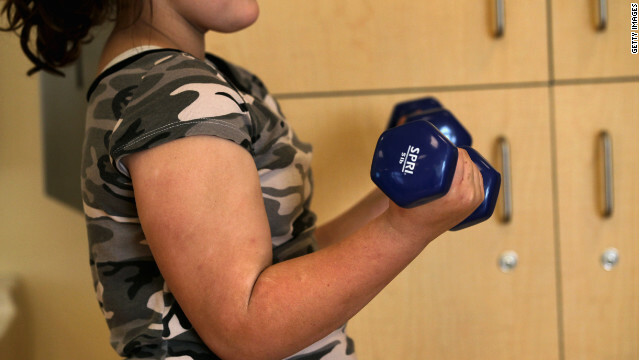 "Girls in the program gained less weight than those who weren't in the program, and they reduced their overall body mass index, improved their self-image and developed healthy lifestyle habits, so all of these are successes." After the six months, both groups health and weight were assessed and then again at 12 months. The girls started out with an average weight in the 190 pound range, and an average body mass index in the 97th percentile, which by CDC standards is considered to be obese. At the end of the study, girls who participated in the Kaiser program were in the 95th percentile, while girls in the usual-care group were in the 96th percentile. Although the weight loss was not drastic, researchers noted the girls who participated in the program continued to lose modest amounts of weight as the months went on, helping them to better cope with their weight issues. « Previous entryWhat the Yuck: Can I drink on antibiotics? If you currently have pre-existing conditions like me that have prevented you from being able to qualify for health insurance for at least six months you will have coverage options under new health care. Check "Penny Medical" to find how to get quality insurance for dollars. very nice and perfect article for everyone who want to be slim and trim whole life. We were friends too. I can still piutrce then on their wedding day! What a tragic shock! If you find out some news would you please post it here. We will be watching. Where can I find this weight loss program for teen girls in Massachusetts. a good high intensity work out will do wonders! It would have been interesting if they had looked at other measures of health (cholesteral, blood pressure, self esteem). In these studies often those improve even if the participants don't loose weight. But this pretty much shows what we know- weight loss programs generally only work for a fraction of the participants, and then generally only for a short period of time. There are anecdotes of people loosing drastic amounts of weight, but that is pretty rare. My conclusion is until we find a better way to handle that, a focus on healthy living regardless of weight (exercise, eat right, etc) is probably the most cost effective way to improve health outcomes. Most likely our solution, like our solutions for many things, will be finding ways to prevent obesity (especially the more severe, 40 BMI+ that is associated with the serious health complications) rather than treating obesity. And with people who are obese, again, you can focus on healthy living but very few people are going to have anything more than modest reductions in BMI over the long term. I understand what the program is but what's the number and address for the program. People need real food. Especially young people. I am not surprised that inane nutritional advice such as "don't drink soda", "eat more fruit" and "eat less" produced these pathetic results. If Kaiser had instead told the girls... you are getting fat because all of the sugar and wheat products you consume make you want to eat more (see this link - http://www.trackyourplaque.com/blog/2012/02/my-letter-to-the-wall-street-journal-its-not-just-about-gluten.html); fruits and veggies are great but let's face it you can't nourish your body with just that; oh, and by the way, we made a mistake about the fat. Not only is fat (real fat, not the tephlon-like trans fats pumped into processed foods) NOT bad for you, it is ESSENTIAL (along with protein... not the one they put in Gatorade .. real protein from animals and plants). So essential, that the lack of it in your diet may not only be contributing to your eating MORE wheat and sugar, but also to making you depressed and tired and foggy-headed and craving any carb you can get your hands on. That might have actually helped the girls get to normal body size by the end of one year. If they had done this along with Nicole's suggestion of monitoring blood pressure and blood lipids (not total cholesterol, which a meaningless number, but rather their ratio of HDL: tryglicerides (which should be 1:1) we would now have a study worth writing about. As it is, I am not sure why this is even in print. What really makes me mad is that these girls no doubt now believe that there is something wrong with them for not being able to lose more weight. When, in reality, they were undermined from the outset with sadly misguided nutritional advice. The same nutritional advice that keeps Americans getting sicker (and fatter) every day. I'm 13, and Underweight, i'm not anorexic or anything, I just CAN'T gain weight. Losing wight is not easy, and if you cant drop some weight fast, you lose the drive to stick with it. I used injectable HCG from RealRxHCG, Once you drop 20-30 pounds its, easy to stick with a diet. At Kaiser Permanente in Panorama City, CA, we recognizie that teens embrace technology as a way of life. In order to support teens in their efforts to stay healthy, we have just launched a new website, kptto.org, which provides teens information on healty eating and active living. The website features a discussion board, health quizzes, videos and resource links that are easily accessible from any PC or smartphone. Are there any hip hop clubs left in Manila besides Manor? I can't hadnle rock, top 40, dance disco mash up crap. I know they want a cater to the masses but how you can dance or get into the music when they play rock song mixed into a dance track with rap over the top of it? I don't know maybe it's just me. Love the site been looking for a site like this for a long time! Could you guys possibly add a review section each club? That way people can tell others about the crowd, what music they play on what nights and provide other info? Hello my loved one! I want to say that this post is amazing, nice written and come with almost all significant infos. I'd like to see extra posts like this .